Rose bushes often are a gardener’s pride and joy; however, when it’s time for a change or your roses are not thriving, the task of removing and killing them for good may seem daunting. Even though roses are hearty plants, if you combine pruning, excavation and the use of an herbicide, you can get rid of your unwanted rose bushes. 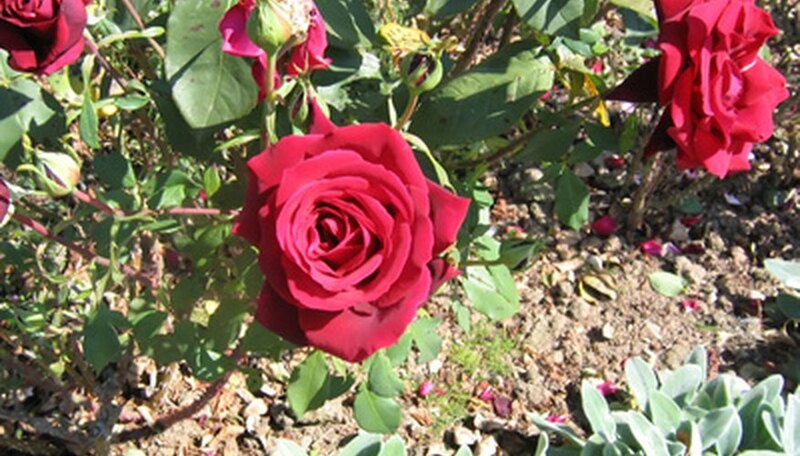 Cut down your rose bush so about 2 to 3 inches remains above the ground. Use lopping shears or a saw for the larger branches. Discard the limbs at your local yard waste facility, if possible. Poke around the root ball with a sharp spade. As you feel roots, move a bit farther out and dig. Cut in toward the center of your rose bush to get under the root ball. Lift the root ball up and out of the hole with your spade by pushing down on the handle. Be careful not to break your spade. You can also pull up on the bush from the top. Remove as much of the remaining roots as possible. Dig deeper in the hole and on the sides to locate and remove the feeder roots. Wearing gardening gloves, feel around with your hands to locate more roots, if necessary. Spray any new growth in the fall after it matures with an herbicide that contains glyphosate. This will kill any remaining roots that survived the excavation.